The benefits of dog walking. Maintaining your dog’s health is one of the primary advantages of regular exercise. It reduces the risk of heart disease and other illnesses such as arthritis and obesity as well as minimizing the development of behavioral issues. Lack of exercise can result in boredom and frustration and in an attempt to relieve these feelings dogs often develop aggressive and destructive behaviors such as excessive barking, digging, chewing, or trying to escape. Less prone to digestive problems (unless he is allergic to the food he’s fed). How much exercise is enough? It varies according to size, age and breed. Younger dogs and larger breeds need at least 40 minutes of moderate to intensive cardio a day. Smaller breeds should get at least a 20 to 30 minute workout and 2 to 3 walks per day. More active breeds such as terriers and hunting dogs may need more. It’s important to identify those activities that are stimulating and motivating and activities that will excite and encourage your dog to exercise. Obesity is a huge problem today – 54% of all dogs are either overweight or obese. With regular exercise however, obesity can be controlled. 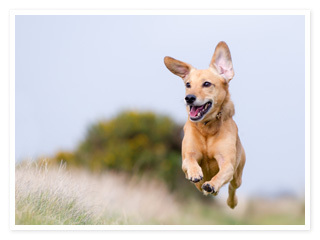 A regular exercise program is essential to helping your dog live a healthier and happier life. So get out and have some fun with your dog that gives you both quality exercise! You’ll be glad you did! View our Dog Walking packages and book a dog walker to receive the benefits of dog walking. This entry was posted in Dog Walking, Information and tagged #YourHound_SA, Dog walking, Early mornings, exercise, fit, Happy Dogs, Joburg streets, nature, park, Socializing, walking. Bookmark the permalink.